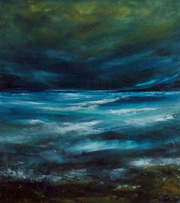 Jan's individual style has been developed over a number of years to create exciting, atmospheric and dynamic paintings. Her work is in great demand and currently exhibited with the National Trust at Belton House, Lincolnshire. Jan is a Professional Associate of the SAA, National Trust Artist and tutor working in Fowey and in Kinoulton, a picturesque village on the Grantham Canal. Jan incorporates both a love of the local landscape with the passion she feels for the dramatic Du Maurier coastline in Fowey. "My breakthrough to professional artist happenened when my husband, Tony and I bought our beautiful holiday home, Smugglers Den. I found my true inspiration in the dramatic Du Maurier coastline. 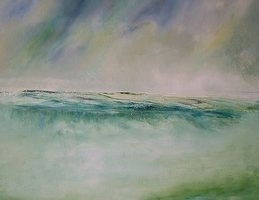 Working mainly in watercolour & oils the paint flowed to create light, the sea and sky. My finely blended oils are layered with natural materials of Estuary sand & shells. As Artist in Residence for the National Trust at Belton House watercolours are mixed with crushed leaves, twigs & moss from the Italian Garden".